GRI challenges governments and companies to work closer together on SDG reporting. April 3, 2019 /3BL Media/ - Global Reporting Initiative chairman Eric Hespenheide has called for greater cooperation between businesses and governments to achieve the UN Sustainable Development Goals (SDGs). 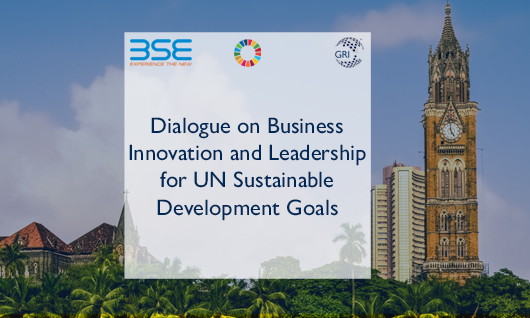 Following the Board of Directors holding their bi-annual meeting in India, GRI today (3 April) partnered with the Bombay Stock Exchange to hold a special dialogue event in Mumbai entitled ‘Business Innovation and Leadership for Sustainable Development Goals’. “More and more governments are realizing the value of corporate social responsibility and sustainability reporting. Indeed, we welcome India’s landmark CSR regulation, which commits 2% of net profit to be spent on CSR. We now need business and governments around the world to work together to adopt sustainable practices and integrate sustainability disclosures, as supported by the GRI Standards, into their core ways of working. The GRI event with the Bombay Stock Exchange took place at the Mumbai International Convention Hall. It included a panel discussion on ‘Business - Government Partnership for Action and Reporting’. ​GRI champions the inclusion of a strong private sector role in the Sustainable Development Goals, as set out through the adoption of SDG Target 12.6. Ahead of his engagements in India, GRI chief executive Tim Mohin hosted an event in Colombo to launch new sustainability reporting guidance for listed companies in Sri Lanka and Bangladesh. The 16-member GRI Board of Directors held their bi-annual meeting in Mumbai on 2-3 April. India’s 2013 Companies Law requires businesses with net worth above $75 million, turnover over $150 million or net profit over $750,000 to spend at least 2% of their annual profits on CSR.